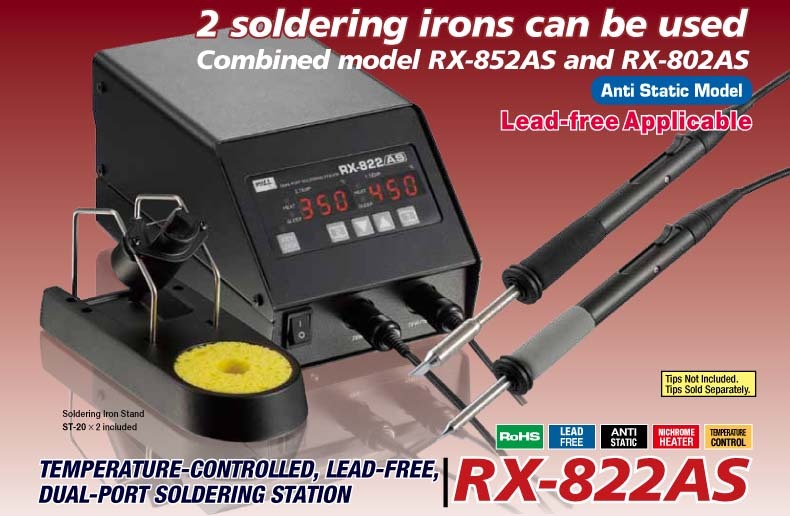 THE ULTIMATE SOLUTION FOR LEAD FREE SOLDERING! Can be prepared with 2 different tip types.Therefore, you can do different types of work [such as Micro soldering /High power work (150W)] at the same time. 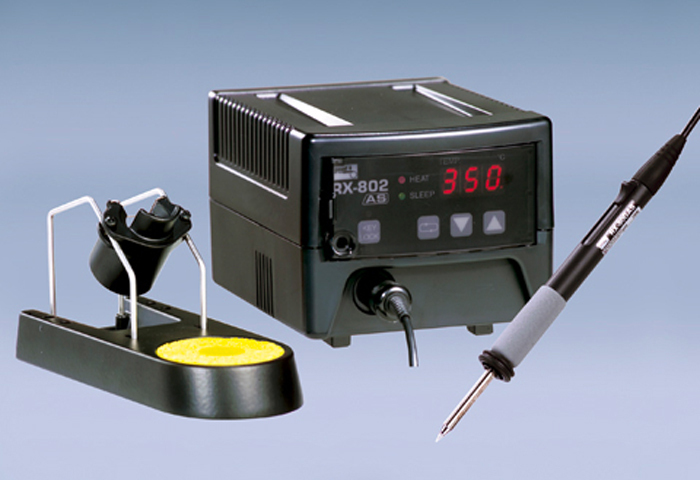 The 2 soldering irons can be set to different temperatures. The set temperature and condition can be checked easily with the separate temperature display. Enables the reworking of chip parts. It is possible to rework chip parts using 2 tips at the same time. Thus, occasional reworking may be performed without requiring other tools. Equipped with intelligent functions such as Sleep function, Sleep function release, Shutdown function and Key lock function by the accumulated technology in the RX-802AS. Equipped with a favorable RX-80GAS/85GAS handpiece. Easy to replace tip without using tools even though a tip is hot. Lighter, reduced heat trasfer, flexible soldering unit cord, and a shorter distance from the handpiece to the tip. Good for more hours of work. 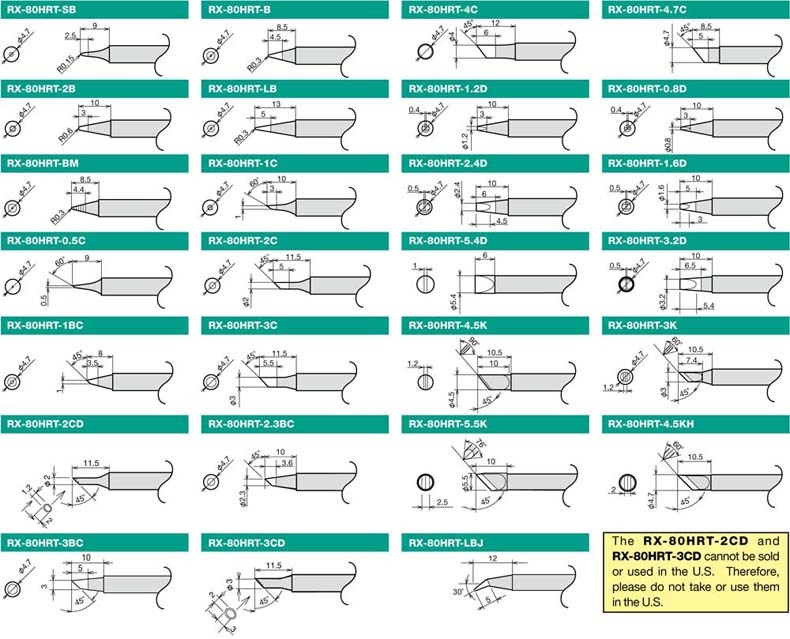 More than 40 shapes of tip are available. You can choose the most suitable tip for your work. To remove the soldering unit tip, slide the lever in the direction of the arrow. The tip will then protrude from the handpiece and can be removed easily by holding and pulling the plastic housing of the integrated tip/heater. Four colours to differentiate between stations, tasks or types of solder being used. Note: Since the heater is integrated in the tip, replacement of only the heater or the tip is not possible. Compact, high output heater (72W), integrated into tip, controlled by high sensitivity sensor. Even during continuous operation the tip temperature remains stable with minimal heat loss. Perfect for working with high melting point lead-free solders. Comfortable usability, easy handling, soft power cord. Shorter distance from grip to tip! Perfect for micro soldering. Reaches Set Temperature in 6 seconds! Slide-change tip. No tools or heat resistant pads needed. Complete lineup of tips with thick iron alloy coating to prevent erosion. New addition! Fine solder coated grooves protect tip from atmospheric oxidation. Built-in heater replacement tips now available at surprisingly low cost! Tamper-proof keypad lock. No need for tools to secure the keypad cover as on previous models. 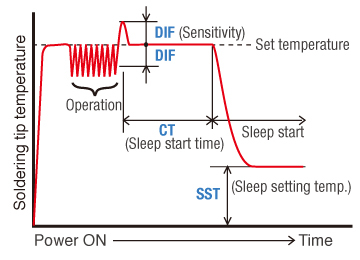 Automatic switch off when inactive for a preset period of time, preventing any overheating. Differences between tip thermometer and displayed temperature are easily corrected by inputting the offset value. Maintenance and tip replacement is simple with integrated tip, sensor and heater. We can provide periodic calibration of the unit if required and issue certification necessary for various purposes (Fees apply). To remove the soldering iron tip, slide the lever in the direction of the arrow. The tip will then protrude from the hand-piece and can be removed easily by holding and pulling the plastic body of the integrated tip/heater. RX-EA1 Fume extraction Attachment has been developed to remove toxic fume from tip area during soldering. The attachment consists of the extraction stainless steel tube, front modified ring and flexible tube with 5 holders to attach soldering wire cord. It takes only 2 minutes to attach RX-EA1 to the iron. The tube ID is 5 mm to make the extraction effective with common tip fume extraction units like XTRACTOR XF-10 or XF-VT2 High Vacuum Units. 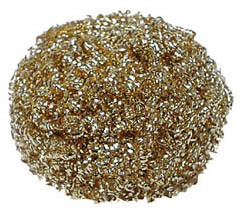 The cleaner itself is made from low-abrasive brass shavings. No water is required to use the tip cleaner, although it cleans the tip better than conventional sponges and reduces the temperature-loss that occurs when using a wetted sponge. 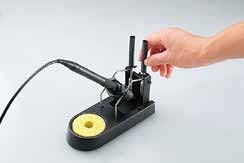 The container is made of heat-resistant and slip-proof silicon rubber that is safe for both the soldering iron and the user. Lead-free solder's melting point is 34 degrees higher than conventional solder. 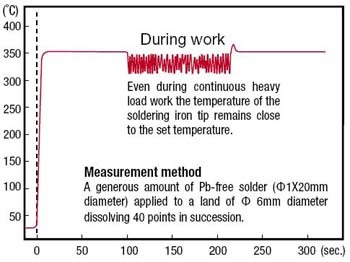 Extra heat is required to bring lead-free solder to liquid phase. 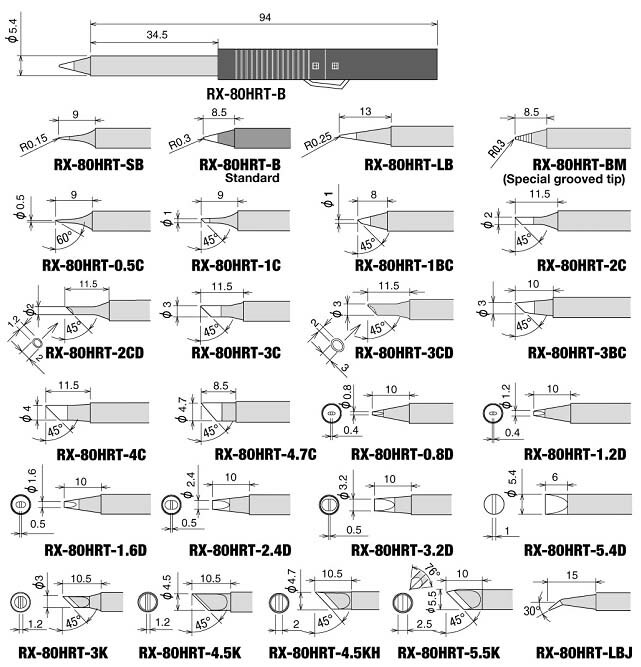 Effect on soldering iron tips - shorter tip life. However, when using lower operating temperatures with lead-free solder which has a higher melting point, operational efficiency will decrease. However, continuous use of a soldering iron over long periods brings the temperature of the tip down, and effects the quality of the finished solder joint. Tips used at 320 degree-Celsius last three times longer than that of tips used at 380 degree-Celsius-tips. For any normal solder joint, three times more Lead-free solder is required compared to eutectic solder - therefore choice and price of solder is important. Cored thread solder wire has flux in the core of the solder wire. The types of flux used in current lead-free solders is especially ACTIVE in order to assist solder wettability. Therefore, using MORE of a solder wire with MORE active flux, commensurately decreases tip life. 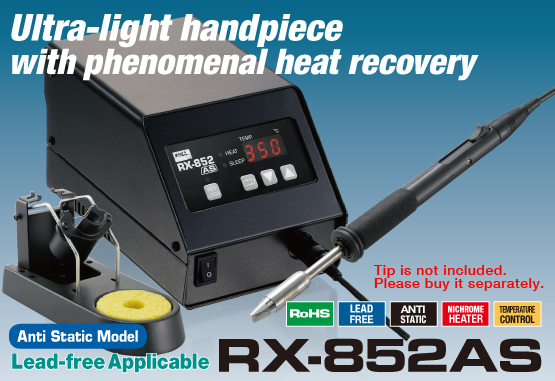 Built-in high-powered heater (72W) capable of delivering enough power to maintain stable tip temperatures, even under different soldering work conditions. Minimal heat loss means the user doesn't have to set the station at a higher set temperature. Capable of being set at lower temperatures, therefore decreasing tip degeneration when soldering with high melting point lead-free solder. All RX-80HRT tips have a thick iron coating. For example, the thickness of the B-type iron coating is 0.5 mm or above, while the thickness of tips in competitor irons are between 0.25mm and 0.3mm. More thickness assures longer tip life. The following test report backs up this fact. While continuously supplying lead-free solder to the tip, measured time taken till a hole appeared in the tip surface. Reaches tip temperature in 6 seconds. Automatic switch off when inactive for a preset period of time. This is easier on the tips than switching the unit OFF. 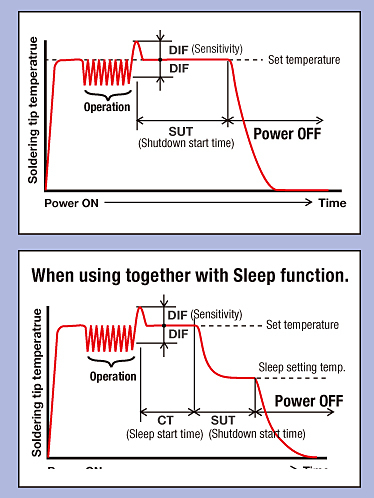 This unit's sleep function can be programmed to activate at preferred inactive time periods, or can be programmed to go into sleep mode at a certain drop in tip temperature, therefore applicable to a variety of work conditions. (Competitor stations have one set mode only.) Further, before sleep mode activates, the sleep lamp flashes, warning the user that the the unit is about to enter sleep mode. It is neglected point but, the biggest selling point of the RX-802AS is that the whole iron length of the handpiece is shorter than competitor irons. It is not enough that the distance between tip and handpiece be short. Pulling force from the cable is applied to the tip evertime the iron is moved. This has adverse effects for operation. Lessening this force is important. Shorter iron length makes this force smaller. One-Step-Slide tip can be changed while the tips remain hot. 6.1. No tools needed for changing the tip, also no heat-resistance pads! 6.3. The tips are designed NOT to come in contact with the surface when placed on a workbench. Standard tip is included with this unit. This is not offered with competitor's stations. Excellent heat recovery has been achieved by combining a 150W compact high output heater with a high-sensitivity-sensor. It makes difficult work that requires high heat capacity, easy. All-in-one tips with the heater and sensor built in making maintenance and tip changing as easy as possible. 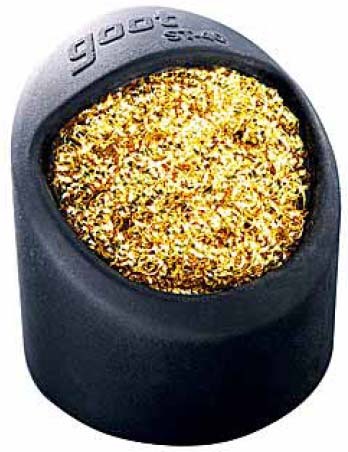 All tips with extra thick coating to prevent erosion caused by the use of lead-free solder. 42 shapes of tip available, including the 26 optional tips for the RX-802AS. An alarm sounds (to alert the user) when the temperature goes outside (above or below) the maximum or minimum temperature settings. High/low setting range 3°C–100°C. The unit automatically shuts down when not used for a preset period of time. This means that the unit turns itself off, if you forget to! Alarm sounds if the iron is left in contact with the component longer than the specified/set time. This prevents inexperienced operators from overheating the component, and in turn helping quality control. The calibration function digitally offsets the difference between the tip temperature and the temperature shown by a tip thermometer being used. New ergonomically designed soldering unit provides comfortable usability, easy handling and a shorter distance from grip to tip. We can provide periodic calibration of the unit if required and issue certification necessary for various purposes.